Today kicks off the 10th annual Tribeca Film Festival (TFF). Founded by Robert De Niro and Jane Rosenthal back in 2002, as a response to the aftermath of September 11, 2002 in an effort to contribute to reviving the vitality of lower Manhattan. Other notable highlights to consider (especially if you are in the city) are: Zach Braff (JD from Scrubs), introduces his latest independent film, The High Cost of Living. Braff will also answer questions online during the TFF HERE. There's going to be a live conversation with Sean Penn as he launches his latest film as the executive producer of Love Hate Love. (Go HERE to learn more). 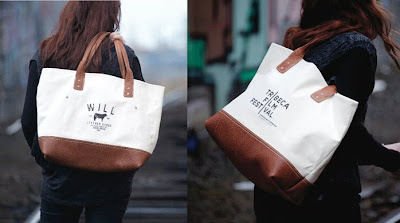 In the meantime, while you're still trying to figure out who, what, where and how you'd like to see the Tribeca Film Festival this year, have a watch at the video (above) to see what goes into making those TTF leather canvas bags you'll be seeing around, courtesy of WILL Leather Goods. The Tribeca Film Festival is from April 20 - May 1.